I was watching the Headline News channel (HLN) and they reported on how some birds are holding up a construction project in D.C. Apparently there is some construction being done, but with all of the inclement weather, the workers took a little break to work on other things. When they came back to their original area, the workers discovered a pair of osprey that had built their nest atop a crane. 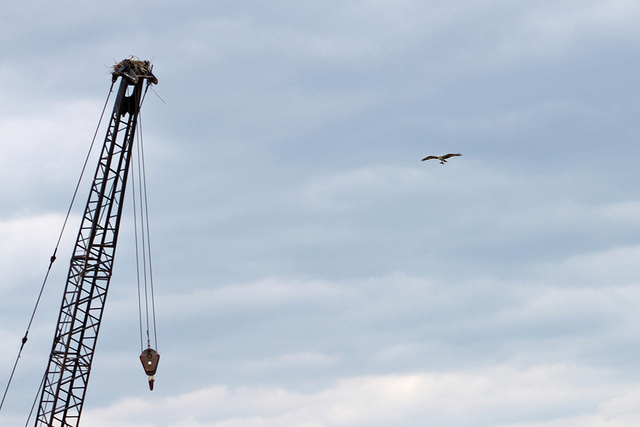 Because of the International Migratory Bird Act, which protects birds from human interaction, the workers have to wait until the osprey’s eggs have hatched and their offspring can fed for themselves before they can operate the crane and construction can continue. The wait can take roughly three months. It appears that despite the craziness in the world, we do still offer some sort of respect for life. Sounds like the perfect scenario for a real life “Duck Hunt” session aka as natural selection. When liberals go too far. Holding up construction for some birds. Smh.